Mr. Chairman, Members of the Class of 1953, Ladies and Gentlemen; I am happy to see you young men again, three and three quarters years after I first saw you, in the chemistry lecture room, when the first lecture in General Chemistry was given. You look about the same to me today as you did then: I know, of course, that you have got nearly four years older, but I too am nearly four years older, and the tendency that people have to classify others relative to themselves causes me still to put you in the class of people much younger than I. It is true that you look somewhat different - not so wide-eyed, not so enthusiastic, but, I think, wiser, more understanding, with greater mastery of yourselves. I think that part of this change is due to greater maturity, and part of it to the fact that you have had scientific training. I can't remember whether it was Neil Stephanides or I who suggested the title of my talk "The Scientific Outlook on Life." Whether it was he or I who suggested it, I do not know mind at the time - whether it was to talk about how a man with scientific training looks at the world about him now, and uses his scientific training in making decisions about his personal activities, about social and political questions, about how to vote, and so on; or whether it was to talk about the nature of life, of living organisms, how life got started on this earth, how human beings and other living organisms have evolved to their present state, what molecules there are that take part in metabolic reactions, what the molecular mechanism of self duplication of organisms, of reproduction, is. I have decided to talk about all of these subjects. First, let me say what we mean by the scientific outlook. I think that we mean the outlook that scientists, people who have had scientific training, have. This might be described as the application of the scientific method, and I shall first say a few words about the scientific method. There is a popular idea that the scientific method consists in applying the principles of rigorous argument that are developed in mathematics and in logic, and in reaching conclusions that must be accepted. This is not true - instead, a scientist always has to ask what the chance is that a conclusion that he reaches is true. In a branch of mathematics the basic postulates are accepted as axioms, and the entire subject is then derived from these postulates; and the mathematician does not concern himself with the question of whether the assumed postulates are true or not. In science, and in other fields of human activity, the basic postulates - principles, laws - are not known, but must be discovered. The process of discovering these laws is called induction. The first step in applying the scientific method consists in finding some facts, by observation and experiment. The next step is the classification and correlation of many facts by one statement. Such a general statement, which includes within itself a number of facts, is called a law. We must recognize that the process of induction is never completely reliable, and that the scientific laws that have been obtained through our observation of the world and through experiment have only a certain probability, less than unity, of being correct. The fact that the probability is not unity, even for such a law as that of the constancy of composition of water, was demonstrated in 1929 when Giauque discovered isotopes of oxygen, and shortly thereafter Urey discovered isotopes of hydrogen. In fact, scientific laws are in a continued process of refinement. The more facts there are that support a generalization, a law, the greater the probability is that a law can be relied upon. It is wise to remember that a law obtained by the process of induction may at any time be found to have limited validity. Conclusions that are reached from such a law by the process of deduction must be recognized as having a probability of being correct that is determined by the probability that the original law is correct. To apply the scientific method one must keep an open mind. It is necessary to find out what the facts about any question are - all of the facts. Any general principle upon which you rely must be compatible with all of the facts. You must then recognize that the general principle is still not necessarily true, and you must estimate the probability that it is true, and rate your conclusions accordingly. This means that it is scientific to be skeptical. If you have the scientific outlook on life you do not accept any statement, any law of nature, any dogma as necessarily rigorously true, without question. It is also scientific to be imaginative. Many of the greatest contributions to science have been made by men who were imaginative enough to think of something that no one else had thought of before. An example is the discovery of the theory of relativity by Einstein, in 1905. No one had told Einstein to discover the theory of relativity, because no one in the world had thought of the basic idea that underlies this theory. The theory itself was essentially discovered when, through his great imagination, Einstein first formulated it. Moreover, you must remember that it is your duty to make up your own mind, to reach your own conclusions. You are not applying the scientific method if you accept a statement made by somebody else. You may, of course, take consideration of the fact that somebody else has made a certain statement; but you yourself must draw your own conclusions after you yourself have considered the facts. This statement, of course, applies not only to the scientific outlook on life - it is the outlook on life of the educated man. It is the function of the educator to teach students how to consider the facts - all of the facts - and to draw their own conclusions. Two months ago today I was in Brussels, to attend the Ninth Solvay Congress in Chemistry. Having arrived a day early, I walked about the old city, which I had not visited for 26 years, in order to see what it was like. By accident I came onto a square in which there was a statue to Francisco Ferrer. On the pedestal was a statement that he had been short at Mont Juyck on 15 October 1919, a martyr to the liberty of conscience. There was also a quotation from a letter written by him on 24 January 1907. "Rational education should and must discuss everything, should and must put young people on the simple and direct path of personal investigation." I learned by asking one of the professors about Francisco Ferrer that the students of the Free University of Brussels, where the Solvay Congress was held, make every year a pilgrimage from the university to the Francisco Ferrer Square. Francisco Ferrer y Guardia, born in Spain in 1859, went to Paris in 1886, after the collapse of the Spanish Republic, and in 1899, when he had received a legacy, he returned to Spain and set up a school, the Escuela Moderne, in Barcelona, with the idea of substituting secular education for clerical education. We can see that there has been much improvement during the last 45 years - or perhaps I should say that the situation in the United States in 1953 for applying the scientific method, for having an open mind and teaching young people to have an open mind and to make up their own minds, after discovering the facts, is much better than it was in Spain 45 years ago. Perhaps this would be a good time to say a word about a difficult situation that exists in the United States now, relating to universities and university professors. I can discuss the situation, in respect especially to the scientific outlook on the world, by discussing a statement bade by the Association of American Universities, and adopted on 24 March 1953. This statement has the title "The Rights and Responsibilities of Universities and Their Faculties." It was written by a committee with President A. Whitney Griswold of Yale University as chairman. The statement has not been adopted by the California Institute of Technology nor, I think, in general by other universities, but has been approved by the Association. It has been attacked by the Association of American University Professors, and I should like to point out why the University Professors have not accepted it. The statement by the Association of American Universities is in the main a fine one. It points out "that a university is the institutional embodiment of an urge for knowledge that is basic in human nature and as old as the human race; that to fulfill their function the members of university faculties must continue to analyze, test, criticize, and re-assess existing institutions and beliefs, approving when the evidence supports them and disapproving when the weight of evidence is on the other side. Such investigations cannot be confined to the physical world. The acknowledged fact that moral, social, and political progress have not kept pace with mastery of the physical world shows the need for more intensified research, fresh insights, vigorous criticism, and inventiveness. The scholar’s mission requires the study and examination of unpopular ideas, of ideas considered abhorrent and even dangerous." "Timidity must not lead the scholar to stand silent when he ought to speak, particularly in the field of his competence. In matters of conscience and when he has truth to proclaim the scholar has no obligation to be silent in the fact of popular disapproval." "What applies to research applies equally to teaching. So long as an instructors observations are scholarly and germane to his subject, his freedom of expression in his class room should not be curbed. The university student should be exposed to competing opinions and beliefs in every field, so that he may learn to weigh them and gain maturity of judgment. The criticism, that has been given the statement relates to other sentences in it. In discussing the professors in the university, the statement is made that "they are united in loyalty to the ideal of learning, to the moral code, to the country, and to its form of government". If this statement were to be taken literally, it would mean that only American citizens could be professors in the university - and yet some of our greatest professors have been foreigners, who held professorships in the United States for a short time, or who had come as immigrants, and had not yet become citizens. Moreover, there is nothing wrong or illegal about questioning the form of government of the United States. It is illegal to attempt to overthrow the government by force; one might, however, feel strongly that the form of government should be improved in some way. I am not completely satisfied, for example, with the system of Congressional investigating committees. I may point this out by quoting from an article "The Lynskey Tribunal: the British Method of Dealing with Political Corruption." in the Political Science Quarterly, the publication of the Academy of Political Science – I am a member of the Academy of Political Science. The author, discussing the parliamentary committees that are set up to investigate political corruption, states "The right of witnesses to be examined by their own counsel after cross-examination by the tribunal’s counsel, and the right of their counsel to cross-examine hostile witnesses are very significant differences from the procedure of our Congressional committees." The molecular nature of life. Letter from Prof. Dr. H. Huisgen of the Institut fur Organische Chemie to LP RE: [Letter in German, awaiting translation]. [previous letter from Dr. Huisgen to LP May 20, 1953]. 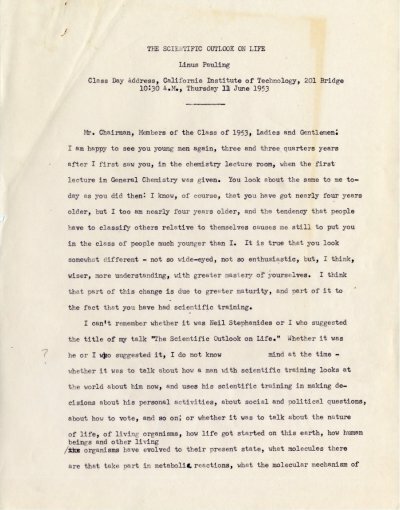 Letter from Prof. H. D. Springall to LP RE: requests that LP write a forward for his book on proteins. Writes that his lab is doing well, as is the University College of North Staffordshire. [Letter from LP to Prof. Springall March 30, 1953, letter from LP to Prof. Springall June 30, 1953] [Filed under LP Correspondence: Box #367, Folder #6: File (Springall, H. D.)]. Letter from Stanley Schaefer, W.H. Freeman and Company, to LP RE: Enclosed is a cover suggestion for the second edition of General Chemistry. [Filed under LP Books: Box 1953b, Folder 1953b.1].